This page describes how to install the Android SDK and set up your development environment for the first time. If you encounter any problems during installation, see the Troubleshooting section at the bottom of this page. If you already have an Android SDK, use the Android SDK and AVD Manager tool to install updated tools and new Android platforms into your existing environment. For information about how to do that, see Adding SDK Components. Before getting started with the Android SDK, take a moment to confirm that your development computer meets the System Requirements. In particular, you might need to install the JDK, if you don't have it already. The SDK starter package is not a full development environment—it includes only the core SDK Tools, which you can use to download the rest of the SDK components (such as the latest Android platform). If you haven't already, get the latest version of the SDK starter package from the SDK download page. If you downloaded a .zip or .tgz package (instead of the SDK installer), unpack it to a safe location on your machine. By default, the SDK files are unpacked into a directory named android-sdk-<machine-platform>. Make a note of the name and location of the SDK directory on your system—you will need to refer to the SDK directory later, when setting up the ADT plugin and when using the SDK tools from the command line. Android offers a custom plugin for the Eclipse IDE, called Android Development Tools (ADT), that is designed to give you a powerful, integrated environment in which to build Android applications. It extends the capabilites of Eclipse to let you quickly set up new Android projects, create an application UI, debug your applications using the Android SDK tools, and even export signed (or unsigned) APKs in order to distribute your application. In general, developing in Eclipse with ADT is a highly recommended approach and is the fastest way to get started with Android. If you'd like to use ADT for developing Android applications, install it now. Read Installing the ADT Plugin for step-by-step installation instructions, then return here to continue the last step in setting up your Android SDK. If you prefer to work in a different IDE, you do not need to install Eclipse or ADT. Instead, you can directly use the SDK tools to build and debug your application. The Introduction to Android application development outlines the major steps that you need to complete when developing in Eclipse or other IDEs. The last step in setting up your SDK is using the Android SDK and AVD Manager (a tool included in the SDK starter package) to download essential SDK components into your development environment. The SDK uses a modular structure that separates the major parts of the SDK—Android platform versions, add-ons, tools, samples, and documentation—into a set of separately installable components. The SDK starter package, which you've already downloaded, includes only a single component: the latest version of the SDK Tools. To develop an Android application, you also need to download at least one Android platform and the associated platform tools. You can add other components and platforms as well, which is highly recommended. If you used the Windows installer, when you complete the installation wizard, it will launch the Android SDK and AVD Manager with a default set of platforms and other components selected for you to install. Simply click Install to accept the recommended set of components and install them. You can then skip to Step 5, but we recommend you first read the section about the Available Components to better understand the components available from the Android SDK and AVD Manager. From within Eclipse, select Window > Android SDK and AVD Manager. To download components, use the graphical UI of the Android SDK and AVD Manager to browse the SDK repository and select new or updated components (see figure 1). 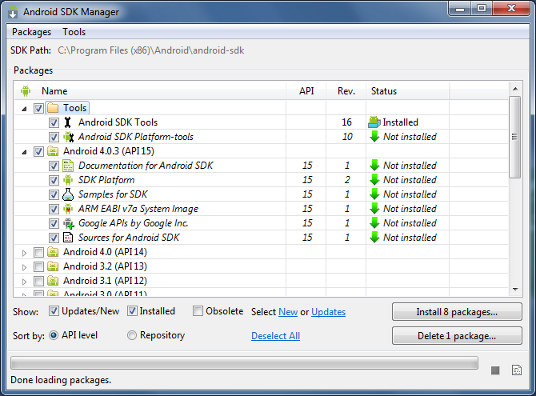 The Android SDK and AVD Manager installs the selected components in your SDK environment. For information about which components you should download, see Recommended Components. Figure 1. The Android SDK and AVD Manager's Available Packages panel, which shows the SDK components that are available for you to download into your environment. By default, there are two repositories of components for your SDK: Android Repository and Third party Add-ons. SDK Tools — Contains tools for debugging and testing your application and other utility tools. These tools are installed with the Android SDK starter package and receive periodic updates. You can access these tools in the <sdk>/tools/ directory of your SDK. To learn more about them, see SDK Tools in the developer guide. SDK Platform-tools — Contains platform-dependent tools for developing and debugging your application. These tools support the latest features of the Android platform and are typically updated only when a new platform becomes available. You can access these tools in the <sdk>/platform-tools/ directory. To learn more about them, see Platform Tools in the developer guide. Android platforms — An SDK platform is available for every production Android platform deployable to Android-powered devices. Each SDK platform component includes a fully compliant Android library, system image, sample code, and emulator skins. To learn more about a specific platform, see the list of platforms that appears under the section "Downloadable SDK Components" on the left part of this page. USB Driver for Windows (Windows only) — Contains driver files that you can install on your Windows computer, so that you can run and debug your applications on an actual device. You do not need the USB driver unless you plan to debug your application on an actual Android-powered device. If you develop on Mac OS X or Linux, you do not need a special driver to debug your application on an Android-powered device. See Using Hardware Devices for more information about developing on a real device. The Third party Add-ons provide components that allow you to create a development environment using a specific Android external library (such as the Google Maps library) or a customized (but fully compliant) Android system image. You can add additional Add-on repositories by clicking Add Add-on Site. Basic SDK Tools If you've just installed the SDK starter package, then you already have the latest version of this component. The SDK Tools component is required to develop an Android application. Make sure you keep this up to date. SDK Platform-tools This includes more tools that are required for application development. These tools are platform-dependent and typically update only when a new SDK platform is made available, in order to support new features in the platform. These tools are always backward compatible with older platforms, but you must be sure that you have the latest version of these tools when you install a new SDK platform. SDK platform You need to download at least one platform into your environment, so that you will be able to compile your application and set up an Android Virtual Device (AVD) to run it on (in the emulator). To start with, just download the latest version of the platform. Later, if you plan to publish your application, you will want to download other platforms as well, so that you can test your application on the full range of Android platform versions that your application supports. (plus Basic) Documentation The Documentation component is useful because it lets you work offline and also look up API reference information from inside Eclipse. Samples The Samples components give you source code that you can use to learn about Android, load as a project and run, or reuse in your own app. Note that multiple samples components are available — one for each Android platform version. When you are choosing a samples component to download, select the one whose API Level matches the API Level of the Android platform that you plan to use. Usb Driver The Usb Driver component is needed only if you are developing on Windows and have an Android-powered device on which you want to install your application for debugging and testing. For Mac OS X and Linux platforms, no special driver is needed. (plus Recommended) Google APIs The Google APIs add-on gives your application access to the Maps external library, which makes it easy to display and manipulate Maps data in your application. Additional SDK Platforms If you plan to publish your application, you will want to download additional platforms corresponding to the Android platform versions on which you want the application to run. The recommended approach is to compile your application against the lowest version you want to support, but test it against higher versions that you intend the application to run on. You can test your applications on different platforms by running in an Android Virtual Device (AVD) on the Android emulator. Once you've installed at least the basic configuration of SDK components, you're ready to start developing Android apps. The next section describes the contents of the Android SDK to familiarize you with the components you've just installed. For more information about using the Android SDK and AVD Manager, see the Adding SDK Components document. Once you've installed the SDK and downloaded the platforms, documentation, and add-ons that you need, we suggest that you open the SDK directory and take a look at what's inside. The table below describes the full SDK directory contents, with components installed. add-ons/ Contains add-ons to the Android SDK development environment, which let you develop against external libraries that are available on some devices. docs/ A full set of documentation in HTML format, including the Developer's Guide, API Reference, and other information. To read the documentation, load the file offline.html in a web browser. platform-tools/ Contains platform-dependent development tools that may be updated with each platform release. The platform tools include the Android Debug Bridge (adb) as well as other tools that you don't typically use directly. These tools are separate from the development tools in the tools/ directory because these tools may be updated in order to support new features in the latest Android platform. platforms/ Contains a set of Android platform versions that you can develop applications against, each in a separate directory. <platform>/ Platform version directory, for example "android-11". All platform version directories contain a similar set of files and subdirectory structure. Each platform directory also includes the Android library (android.jar) that is used to compile applications against the platform version. samples/ Sample code and apps that are specific to platform version. tools/ Contains the set of development and profiling tools that are platform-independent, such as the emulator, the Android SDK and AVD Manager, ddms, hierarchyviewer and more. The tools in this directory may be updated at any time using the Android SDK and AVD Manager and are independent of platform releases. SDK Readme.txt A file that explains how to perform the initial setup of your SDK, including how to launch the Android SDK and AVD Manager tool on all platforms. SDK Manager.exe Windows SDK only. A shortcut that launches the Android SDK and AVD Manager tool, which you use to add components to your SDK. Optionally, you might want to add the location of the SDK's tools/ and platform-tools to your PATH environment variable, to provide easy access to the tools. On Windows, right-click on My Computer, and select Properties. Under the Advanced tab, hit the Environment Variables button, and in the dialog that comes up, double-click on Path (under System Variables). Add the full path to the tools/ and platform-tools/ directories to the path. On a Mac OS X, look in your home directory for .bash_profile and proceed as for Linux. You can create the .bash_profile if you don't already have one. If you have just installed the SDK for the first time, go to the Hello World tutorial. The tutorial takes you step-by-step through the process of setting up your first Android project, including setting up an Android Virtual Device (AVD) on which to run the application. Following the Hello World tutorial is an essential first step in getting started with Android development. Take a look at the Dev Guide and the types of information it provides. Read an introduction to Android as a platform in What is Android? Learn about the Android framework and how applications run on it in Application Fundamentals. Take a look at the Android framework API specification in the Reference tab. Get an overview of the development tools that are available to you. Read the Introduction to Android application development. Read Using Hardware Devices to learn how to set up an Android-powered device so you can run and test your application. The Notepad Tutorial shows you how to build a full Android application and provides helpful commentary on the Android system and API. The Notepad tutorial helps you bring together the important design and architectural concepts in a moderately complex application. Following the Notepad tutorial is an excellent second step in getting started with Android development. The Android SDK includes sample code and applications for each platform version. You can browse the samples in the Resources tab or download them into your SDK using the Android SDK and AVD Manager. Once you've downloaded the samples, you'll find them in <sdk>/samples/<platform>/. Take a look at the Community pages to see a list of Android developers groups. In particular, you might want to look at the Android Developers group to get a sense for what the Android developer community is like. Here are the steps to install Java and Eclipse, prior to installing the Android SDK and ADT Plugin. The Ubuntu package manager does not currently offer an Eclipse 3.3 version for download, so we recommend that you download Eclipse from eclipse.org (http://www.eclipse.org/ downloads/). A Java or RCP version of Eclipse is recommended. Follow the steps given in previous sections to install the SDK and the ADT plugin. If JDK is already installed on your development computer, please take a moment to make sure that it meets the version requirements listed in the System Requirements. In particular, note that some Linux distributions may include JDK 1.4 or Gnu Compiler for Java, both of which are not supported for Android development.